I did very little with the horses last week – just one gentle arena session each. The LSH and I planned a long hack on Saturday, but we reduced our initial plan from “a three hour hack” to “a picnic hack” (of undefined length). The weather has cooled down quite a bit since last week, but both horses were still relaxed and content as we groomed and tacked up, so it’s not the warm weather last week that had them so chilled out. We went a route that I’ve done part of with Flurry but Aero has never seen before. Guess who led? Yup, Aero! He was alert and interested in everything, but relaxed and happy the whole time, striding out on the buckle end of the rein. Flurry and the LSH followed along behind us, with Flurry (who is barefoot behind and booted in front) taking the odd detour to avoid particularly rocky stretches. He has become quite clever about picking out an easy path on rocky ground – to some it might seem like meandering, but if you watch what he is doing, he is avoiding rough, stony ground as much as possible. At the first scenic spot we passed, Flurry very purposefully left the track and strode over to the top of the ridge to admire the view. The LSH is becoming used to his little quirks (Flurry loves to stop and admire the view), and allowed him to do what he wanted, so Aero and I turned back and joined them at the edge of the cliff. The valley stretched out below us, with the Luberon in the distance to the left, the village of Viens and the Mont de Vaucluse straight in front, with Mont Ventoux just peeping over its shoulder on the right. Aero stood beside Flurry as they both stared into the distance, then he turned his head around and nudged my left foot. 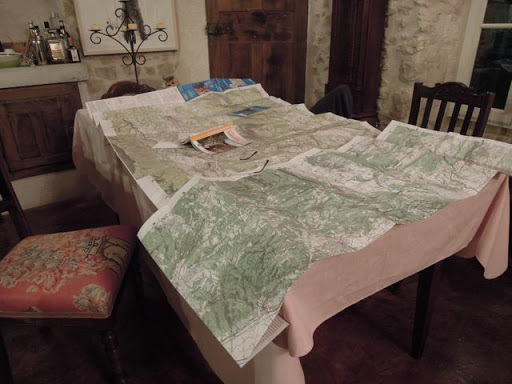 I scratched his neck, rubbed his ears and pointed at Ventoux – “See that, Aero? One day we’re going to do that!” We all looked at the view for another moment or two, then we turned and made our way back to the track. “So can you ride all the way to the top of Ventoux?” the LSH asked. 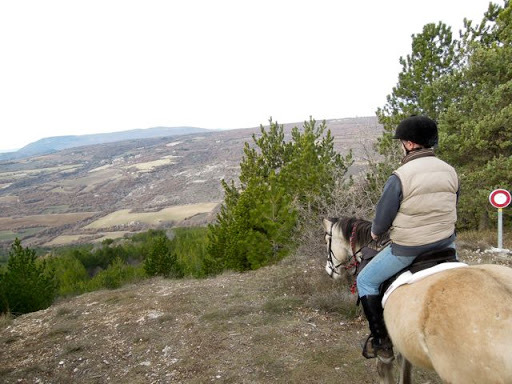 We carried on to the next viewing point at Reclapous, where once again, both horses (and their riders) stopped and drank in the view. There was a heavily mustachioed Frenchman there, standing beside a QatQat (my spelling, not correct, but it means a 4X4 vehicle!) twiddling with the dials on a piece of electrical equipment which had a big aerial. He looked up and greeted us cheerfully. “Mais oui,” he responded ruefully. Gosh I wish I had one of those tracking things for Cookie, I thought, but my language skills definitely don’t extend far enough to get the ironic nuances across, nor could I engage in a conversation about our naughty wannabe cat/chicken/rabbit/mole murderess. We looked at the view for a few minutes and then continued down the hill along a path towards the car park. This was familiar territory for me, I’ve walked here with the dogs loads of times, and I knew that the easiest route for the horses was to leave the roadway and follow a path through the woods. Flurry took the lead for a while, marching along determinedly, weaving through the trees as he followed the path. The LSH is really starting to trust him, he just sat there, ducking branches as necessary, and letting Flurry find his way. “He’s great to follow the path,” he said. I just smiled… that’s Flurry! 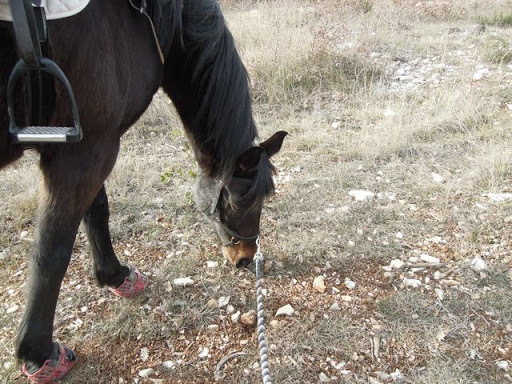 Drop the reins and he’ll pick his way along whatever route you point him at! Aero, meanwhile, was quite content to follow behind Flurry’s fuzzy dun bottom. Again, I felt he was alert and interested in all that was going on around him, but there was no tension whatsoever in his body. I sat and enjoyed the ride, and found myself with an idiotic grin on my face as we marched along – the same face-splitting grin I wore on most of Le Big Trek! We passed two dirt-bikes between Reclapous and the car-park. The first one had plenty of space and motored past us cautiously, but we met the second on a narrow stretch. He stopped and turned his engine off. 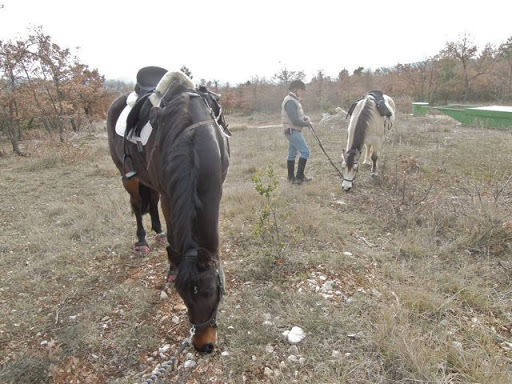 When I thanked him, he replied “C’est normal” – if only all other trail users were so polite! Eventually we came to a spot we deemed suitable for our picnic and dismounted. I removed Aero’s bit and allowed him to graze. Unlike the time I went to the river with MC, when he never really settled during our picnic, he put his head down and cropped the grass with single-minded determination, apart from an initial half-hearted attempt to share my ham and cheese baguette. Flurry was being a bit of a pain, he wanted to eat the LSH’s baguette, drink his water, try the packet of cashew nuts… anything except eat grass, basically. We remounted and made our way home. Both horses were calm, settled, contented – I think “stable” is the word I’m looking for! This is all I have wanted for Aero, that he would be relaxed and confident in his new environment and enjoying his new rôle. I feel that he has really and truly turned a corner. Suddenly anything is possible. Oh my, the trails and the views you have! Just wonderful! Such good horses! It sounds like you had a great ride. Thanks for your encouraging comments while I was at the show.